“Repent” begins with confession. It is recognition of one’s true self and true position before a perfect God. But it doesn’t stop there it also means to reach out and grasp a hold of with the hand of faith the forgiveness that God offers through Jesus as the only answer for that sin. It means to live in the “Kingdom of Heaven” that John was talking about. You see, John didn’t just say that the kingdom was near, the best translations say, “the kingdom of heaven is at hand.” And he means here right now in Jesus. I love the old paintings of John. (BOUTS, Dieric the Younger, St John the Baptist, c. 1470, Web Gallery of Art - www.wga.hu) They often show him holding a little sheep in one hand and pointing to it in the other. That too, is a great definition of the word “repent.” Looking at Jesus for what we need most, forgiveness of sins. Another great thing about John is that even his name reminds us of God’s greatest work in our lives. (Although I’d still like to call him John the Lutheran, (on Baptism) it just doesn’t have the same ring to it). It’s Baptism that’s the sure sign to us of repentance. Oh, I know, lots of folks say that we are baptized because we repent… you know “repent and be baptized.” (Acts 2:38) But that’s not really the case. It’s not repent then be baptized. The people who came to see John weren’t baptized because they confessed their sins. They were baptized, confessing their sins. They saw their need for forgiveness and they saw God offering it and they took hold of it in the way that John said it was offered. After all, just like John said the kingdom was at hand. Baptism isn’t a sign of repentance because we do it. Baptism is a sign of repentance because it’s what God does. It’s the same thing in Acts chapter 2. Peter preached the law to the crowds of people standing before him. “They were cut to the heart.” The author tells us. “What shall we do?” they asked. 38And Peter said to them, Repent and be baptized every one of you in the name of Jesus Christ for the forgiveness of your sins, and you will receive the gift of the Holy Spirit. Acts 2:38 (ESV) They saw their need. Peter pointed them to Christ for the forgiveness of sins, and he told them exactly how God would give them what they needed. John was doing the same thing out in the wilderness of Judea. You see, John is the Baptist! “[Jesus] satisfied the Law; He fulfilled the Law perfectly, for He loved God with all His heart, and with all His soul, and with all His strength, and with all His mind, and He loved His neighbor as Himself. Therefore, when the Law comes and accuses you of not having kept it, bid it go to Christ. Say: There is the Man who has kept it; to Him I cling; He fulfilled it for me and gave His fulfillment to me. Thus the Law is silenced.” Pieper, F. (1999, c1950, c1951, c1953). Christian Dogmatics (electronic ed.). St. Louis: Concordia Publishing House. Never mind that your life doesn’t look like it is fruit-full. Jesus life was. He has borne all the good fruit you’ll ever need. The ax is gone for you; it was laid at a different tree. But to get it all started, first Jesus was born. That’s what gets us back to the quite of the manger. 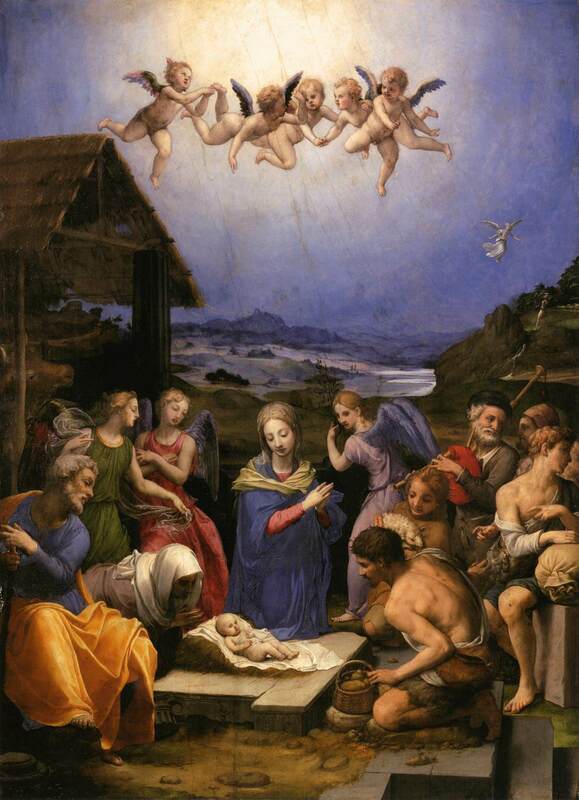 Right there, that stable that we’ll all gaze into with wonder (BRONZINO, Agnolo, Adoration of the Shepherds, 1535-40 Web Gallery of Art - www.wga.hu) in a few weeks, is the “different tree.” It’s utterly amazing, totally beyond our thinking and acting, to believe that anyone would be born specifically to take the whole burden God’s anger, the unquenchable fire of God’s wrath over sin. And to do what we can’t ever hope to do, keep God’s law perfectly in every detail. But there he is, ready and willing to do it. And not only ready and willing, but able to do it. And so he does: from his first breath to his last; from sitting on his mother’s knee to hanging on the cross. Jesus bears the fruit of a perfect life and he dies the death of a complete sinner. John said he wasn’t fit to carry Jesus sandals. In our day we’d say we’re not even worthy to be his water boy. But still, Jesus does it all for us from bloody birth to bloody death. 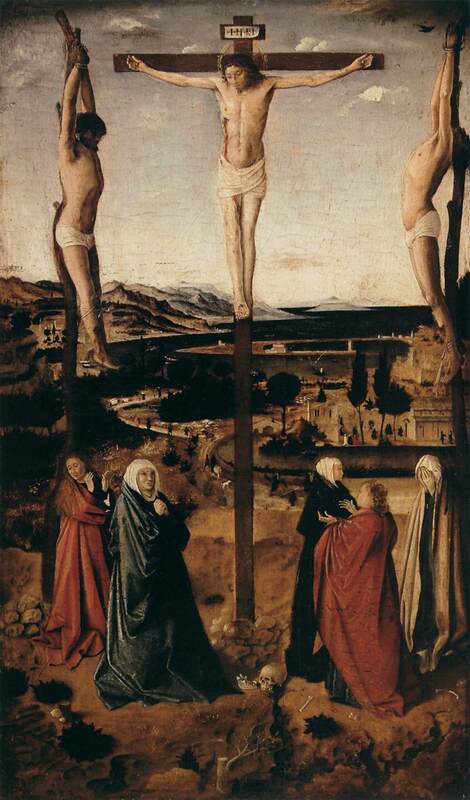 (ANTONELLO da Messina, Crucifixion, 1475 Web Gallery of Art - www.wga.hu) Taking what is ours, sin. And giving us what is his, a perfect life and relationship with God.